Founded in 1909, the American Academy of Religion is the world's largest association of scholars of religion. As a learned society and professional association with about 9,000 members in some 900 colleges, universities, seminaries, and schools in North America and abroad, the Academy is dedicated to furthering knowledge of religion and religious institutions in all their forms and manifestations. This is accomplished through an expanding print and online publishing program; grants; awards; professional services, including workshops and career services; an annual North American meeting; and ten regional meetings through which the Academy serves its members and the advancement of the field. In a world where religion plays so central a role in social, political, and economic events, as well as in the lives of communities and individuals, there is a critical need for ongoing reflection upon and understanding of religious traditions, issues, questions, and values. The American Academy of Religion's mission is to promote such reflection through excellence in scholarship and teaching in the field of religion. The Academy neither endorses nor rejects any religious belief or practice. To become a member of the Academy, click here. To support the work of the Academy, a nonprofit 501(c)(3) organization, click here. 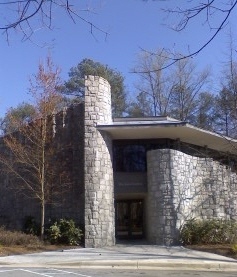 Luce Center at Emory University: AAR's headquarters at 825 Houston Mill Road, Suite 300, Atlanta, GA 30329.